In the middle of winter 1929, a serious diphtheria epidemic broke out in the small colony of Little Red River, Alberta (about 800 km north of Edmonton), threatening the health of the entire settlement. A Hudson's Bay Company official had already died from the disease, and several others were sick. Today, people are vaccinated against diphtheria as babies but in 1929 it was a considerable threat, causing sickness and possibly death. By the time of this incident a cure existed for diphtheria, but the bad news was that Little Red River was 80 km away from the nearest doctor, in Fort Vermilion, and his supply of antitoxin was old and insufficient to contain an epidemic. Two men journeyed 480 km—travelling by dogsled over frozen, snowy ground for almost two weeks—to reach the nearest telegraph station at Peace River, where they could send an SOS message to Edmonton. The telegram came in to Edmonton on New Year’s Day: DIPHTHERIA. FEAR EPIDEMIC. SEND ANTITOXIN. There was not much time left to contain the epidemic. Ministry of Health officials in Edmonton acted immediately, quickly preparing enough diphtheria antitoxin to treat 200 cases. But getting the medicine to Little Red River was a challenge given winter conditions. The fastest option was to fly. Such a dangerous journey called for a skilled pilot: someone willing to risk his or her own health and safety. Health authorities contacted the small Edmonton, Alberta-based flying company, Commercial Airways Ltd., which was run by First World War veteran Wilfrid "Wop" May and his business partner Vic Horner. 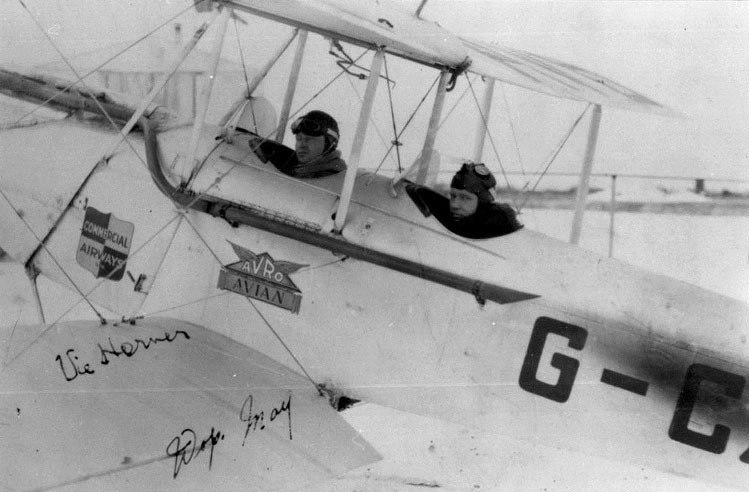 The two men owned an Avro Avian, an open-cockpit aircraft with a small engine and no landing skis. It wasn’t the ideal airplane for the expedition, but May and Horner agreed to take the 600,000 units of diphtheria antitoxin to Fort Vermilion where it would then be transported by dogsled to the tiny settlement at Little Red River. Vic Horner being handed a bundle of Diphtheria antitoxin at the start he and May's journey from Edmonton to Fort Vermillion, Alberta in their Avro Avian, on January 2, 1929. On January 2, 1929 at 12:45 p.m., they took off from Blatchford Field in Edmonton and headed north. The ground temperature was -30 Celsius. The antitoxin was wrapped in woolen blankets with a small charcoal heater to keep it from freezing. After only a short time in the air the two men ran into trouble: the heater had set the blankets around the medicine on fire! They made an emergency landing, threw away the blankets and heater, tucked the antitoxin vials under their armpits and close to their groins to keep the medicine from freezing, and took off once more. Darkness and a looming snowstorm then forced them to land at McLennan, where health authorities had wired ahead to have a landing strip prepared. May and Horner spent the night there, leaving the next morning as soon as it was light: 9:40 a.m. They travelled 80 km to Peace River, stopped to refuel the aircraft, and were on their way again. Following the railway tracks, they reached Fort Vermilion late in the afternoon, just as darkness was setting in. The medicine was then sent by dogsled to Little Red River, and all the inhabitants of Fort Vermilion and Little Red River were inoculated against diphtheria. There was only one casualty. Wop May (right) and Vic Horner (left) on return from Mercy Flight to Fort Vermillion, Alberta, 1929. Engine trouble and illness delayed their flight back to Edmonton, but a crowd of 10,000 gave May and Horner a hero's welcome on arrival. Frostbitten, cold, and exhausted, both men made a full recovery. Kristy von Moos is the Digital Asset Management Project Coordinator at Ingenium. Kristy has a BA in History and Philosophy from St. Thomas University, and an MA in Public History from Carleton University. She has worked with cultural media, research, and virtual exhibit companies, and enjoys bringing history, education, and technology together.